A 10-minute walk east of McMaster University in Hamilton lies Arkell Street. The small residential road is where the alternative rock band Arkells got their name. The band was founded at McMaster in 2004 when lead singer Max Kerman met guitarist Mike DeAngelis at Welcome Week. The members consist of Kerman, DeAngelis, keyboardist Antony Carone, bassist Nick Dika, and drummer Tim Oxford. Now a decade since their debut album, Jackson Square, the band is set to release their fifth studio album, Rally Cry, on October 19. Kerman spoke with The Varsity about the band’s formative years, their contributions to the sports and political worlds, and what’s in store for Rally Cry. The Varsity: What does Hamilton mean to the band? Max Kerman: The whole band grew up in Southern Ontario: London, Guelph, Toronto, Mississauga, Newmarket, but the band was born in Hamilton. That’s the way we like to put it. We feel really lucky being a Hamilton band. We got a lot of opportunities when we were coming up that I feel wouldn’t come to us if we were in Toronto. We had a chance to open up for some of our favourite bands at the local rock-and-roll club because we had good relationships with the promoters, and there weren’t as many bands as there are in Toronto. So I think we got some chances that were unique to being in Hamilton. The other cool thing, when we were in university — I started in 2004 — it was sort of the height of the ‘great indie rock era’ in my mind. A lot of great Canadian bands, Arcade Fire, Broken Social Scene, Constantines — we got to see all those bands at 300 [capacity] clubs, and to see that level of talent up close like that — I think it helped shape who we are. TV: In the summer you played in the Tim Hortons Field in Hamilton for 24,000 fans. What do you think the band means to the city? MK: You know we have a lot of support from the city, or whenever anybody in Hamilton goes out, and [that] makes an impression on the rest of the country. People in Hamilton are especially proud of that. It’s not like anyone’s going to resent you for that. People like their champion — there’s good stuff that’s produced in Hamilton. I think [in] the city, we feel like we get a lot of hometown love when we’re there. I think we’re pretty aware of how awesome each community is, [and] how everybody makes it work, whether it’s small businesses or local community advocates, city councillors — not that everybody always gets along. But I do think that everybody adds something to the party. I am appreciative to be part of the ecosystem that is Hamilton. TV: What accomplishments are you and the band most proud of? MK: That’s a good question. It’s funny because in music, you don’t sign up to be musicians just to win awards. It’s not like sports, where you want to win a championship. And there’s a part of me that thinks winning an award for writing a song, quote-unquote ‘beating out the competition,’ is kind of stupid. I don’t think that art should be competitive in that way. That said, obviously, everyone likes to win awards, so I’m happy about it. I think, for me, the thing I’m most proud of is that we just continue to evolve and grow and remain really curious about what it means to be in a band and have lots of conversations within the group that are like, “What’s the next thing we’re going to do?” We’re always trying to push the “what’s the next thing we can do that would be really interesting and exciting to us” and “how can we get people on board with those ideas or that are part of our live show,” whether it’s a piece of merch or a new song. The fact that we’ve had a steady upward trajectory since we started, I think that’s what I’m most proud of. We’ve never really stagnated. I’m really proud of that. TV: “People’s Champ,” “Knocking at the Door,” and “Whistleblower” are not only sports anthems, but are also strong political anthems. Can you share a little bit about the meaning behind the songs? MK: Yeah, I mean that’s one thing I think we’re proud of… that we sort of [share] our politics [with] a much broader audience, like a broader audience that might not be up for talking about the politics I’m interested in talking about. I mean, a song like “Whistleblower” is an ode to journalists who dig deep and dig in a corner and are exposing the truth to a wider audience. “Knocking at the Door” is about the Women’s March and the idea that you have to keep standing up for what you believe in. And, you know, the Women’s March is so inspiring to me, just because it’s sort of all of the things that I think are essential to our lives, equality and acceptance of all different types of people and compassion, and just continue to fight for that. “People’s Champ” is an anti-Trump song, but I didn’t want to do it in a hit-you-over-the-head kind of way. I kind of wanted it to be a little bit more subtle lyrically. The idea behind that song is [that] I think we should all be disappointed and angry about how the current system works. It’s okay if you didn’t like Hillary Clinton, if you thought she was part of the problem, I think there is an argument for that. But to believe that Donald Trump would be the guy to sort you out — I don’t think it’s the best route to go, because he’d be the last guy to help someone out, in my opinion. TV: We’re seeing this hostility toward the entertainment business, especially for those using their platforms to promote political change. Where do you think musicians stand in politics using their platform for change, and what would you say to people who say just stick to music? MK: I think of all jobs, artists and musicians are the most expected. People aren’t as surprised. I think it actually was surprising when [we had] the late show hosts like [Jimmy] Kimmel talking about health care, or [Colin] Kaepernick, a football player who was talking about police brutality. I think that caught people off-guard and that’s what made some parts of the population annoyed. But I think with musicians, I mean, occasionally I’ll tweet something and somebody goes, “Stick to the tunes” or “I liked you better when I didn’t know your politics.” But I think there is a pretty good precedent with people like [Bob] Dylan or [Bruce] Springsteen or Neil Young [who] talk about their politics in their music. TV: Can you tell me a little bit of the story behind Rally Cry? MK: Actually, this is my first interview with someone who’s heard the whole record. I think there’s certain subjects that over the years that I keep coming back to. I think I tweeted a month ago, when someone asked about the record, that there are three types of songs that we kind of come back to all the time: political songs, love songs, and then there are songs about friends and people in the community. This record is 10 songs, so it’s like three, three, and four. Something like that. “Company Night” is a song that was inspired by Sean Spicer, former White House Secretary, and the idea of being somebody who loses who they are, because all they care about is the name they represented, like in the company they work for. With a song like “Hand Me Downs,” there’s a shame you carry with you from where you come from. I think everybody has got a bit of that in them. “American Screams” is about this hysterical conversation between the left and right in America. It touches a bit on gun violence. The idea of calling it Rally Cry is [that] all the songs have an outward-looking perspective. There’s a message that we want to put out there, and when I think about a rally, it’s a very outward experience. You’re coming together and you’re around people that maybe are like-minded, and that’s why the word ‘rally’ kept coming up over the last year and a half. Whether a political rally or a sports rally, there’s this idea of being part of the community and I think all these songs are not songs that a guy with an acoustic guitar is singing from the deeper parts of his inner emotions, but [from] thinking about the world around you. I like guys with acoustic guitars, but we’re trying to do something a little bit broader. TV: The album is 10 songs and three have been released so far. Of the remaining songs, what song are you most excited for fans to hear? MK: You know, we have four records now, and I think as a fan of bands, I want to be surprised by a band. I want to be surprised and hear something I haven’t heard from the band before. But then, I also want to hear parts of the band that I love and that I come back for, and I think the record has got that. “Hand Me Downs,” to me, is like a “Leather Jacket” 2.0. I think it has that kind of joyfulness, but a bit of sadness. That’s an oxymoron, but the qualities I think people connect with “Leather Jacket,” you’ll find in a song like “Only for a Moment” or “Hand Me Downs,” which I think is comforting as a fan and a listener of our band. But I also want to challenge them to go, “Oh, I haven’t heard that before.” So a song like “Eyes on the Prize,” I think is a good example of that — that’s us doing something different. This is something that we’ve never done before, but eventually want to become part of our catalogue and become a part of who we are. Even a song like “Saturday Night” or “Show Me Don’t Tell Me.” I think we always have a ballad or two and I think [they’re] going to be the [ones]. I think the romantics will connect with [those] most. TV: You guys have mentioned on Instagram that you want to play more campus shows. Have you considered playing at U of T? MK: Yeah, we’re going to figure something out. I don’t know, we do have a big Toronto show in the works. So you’ll hear about that when the record comes out. If it’s not [at] U of T, you’ll just have to go down the street. 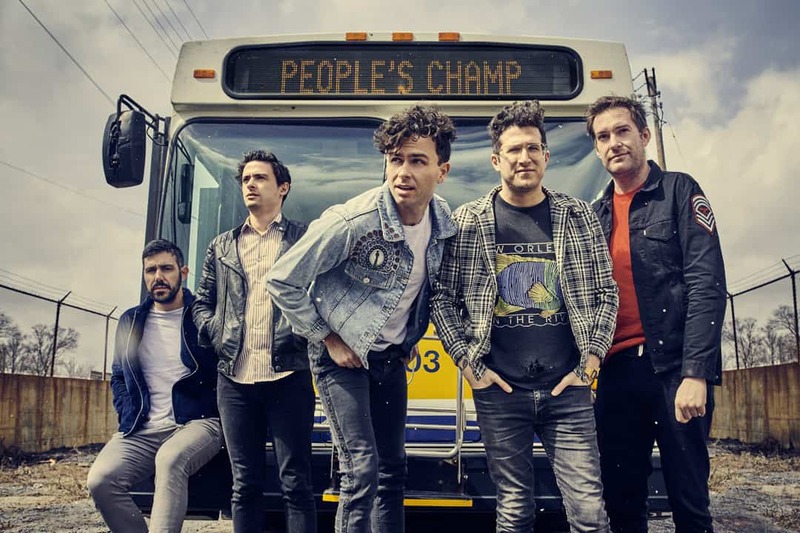 Arkells’ Rally Cry is set to be released on October 19.